Read the story Shapesville by Andy Mills and Becky Osborn to students. This lesson and project is not about which body shape is best, but about the diversity in body shapes that exists and the beauty in all of them. What are the different types of body shapes? There are 8 basic shapes. You will learn what they are and the differences between them using this website to complete the notes form. You will also learn how to best dress each of the body types. Click on the Body Shape Guide tab to get started. Show a traditional Barbie to students and ask them if Barbie has any of the body shapes you just learned about. What’s the problem with her body shape? Why do many parents disapprove of Barbie and refuse to let their children play with the dolls? 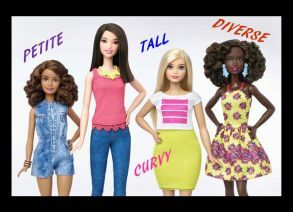 Imagine that Mattel has asked you to design and create a more realistic Barbie based on your body shape or the body shape of someone you know. What would she look like? Sketch out your version of Barbie in color and labeled, including the following: name, height, body shape, hair color, hair style, skin color, and other attributes such as freckles, moles, birthmarks, scars, shoe size, etc. Here are some templates that might be helpful in drawing the body shapes and figures. In the second sketch, you will design an outfit for Barbie, based on the suggestions you learned for that body shape. Students will present their sketches to the class. I like to do this with the document camera, but if you don’t have the technology, then do what works best for you. You could also share as a gallery walk. Discuss with students that what they just did was exactly what Mattel did to make Barbie more realistic. See this cover story from TIME magazine and article and video from USA Today. Discuss thoughts after reading/viewing. Was this a good marketing strategy on Mattel’s part? Why or why not? See consumer reactions here. Mattel is looking for more ideas and outfits for their new line….will you submit your designs?